Growth Factor-9 Review: Will it Really Help You Reach Goals in the Gym? Bottom Line: Growth Factor-9 lacks impressive ingredients. It’s not much more than amino acids, which you can get from food sources and other supplements much more affordably. 2. History of the Brand: How Did Growth Factor-9 Get Started? 6. Who’s Growth Factor-9 For? 7. How Does Growth Factor-9 Work? 8. Does Growth Factor-9 Work? 13. Any Growth Factor-9 Lawsuits? 16. Would Growth Factor-9 Work with Your Diet? 17. Verdict: Would I Recommend Growth Factor-9? Bottom Line: Growth Factor-9 lacks impressive ingredients. It's not much more than amino acids, which you can get from food sources and other supplements much more affordably. Growth Factor-9 is a supplement that claims to be able to boost your HGH (human growth hormone) levels by as much as 6.8x. Of course, my curiosity piqued, and I had to give it a try. But, because my personal experience isn’t enough to base your purchasing decision on, I took things a step further. I looked at the research to support the claim, the ingredients, the company behind the product, and user reviews. By the way, that big, shocking claim is based on one study, featuring 16 people. You’re going to need more than that if you want to prove it effective to me. Adults take 4 capsules with water on an empty stomach, either in the morning two hours before breakfast or two hours after dinner prior to bedtime. Growth Factor-9 is full of amino acids. It claims to boost your physical performance by increasing the amount of the human growth hormone in the body. Growth Factor-9 comes from Novex Biotech. The company has been in business for about 13 years, but there is not much information about it. That made me a bit uneasy. Growth Factor-9 is available as a pill and a powdered drink mix. Most user reviews indicate better results from the pill version, rather than the powdered drink mix. It appears the drink mix is only available in a single flavor. The full chart of amino acids our bodies need. Growth Factor-9 is made with: L-lysine HCL, L-arginine HCL, oxo-proline, N-acetyl L-cysteine, L-glutamine, schizonepeta powder, rice flour, gelatin, magnesium stearate, microcrystalline cellulose, silicon dioxide, and titanium dioxide. Really, it seemså to be nothing more than a re-branded version of SeroVital. The product label says it’s made with a SeroVital blend, and the supplement facts on both are exactly the same. SeroVital is supposed to increase the HGH in your body when combined with exercise. This supplement is manufactured by Novex Biotech, out of Salt Lake City, Utah. Growth Factor-9 is for men and women who want to increase their muscle building potential while working out and eating right. It is mostly targeted at bodybuilders and athletes. It works by increasing the amount of the HGH in your body. I didn’t really notice any changes in my body while I took the supplement. And as with many other supplements on the market, you have some people who say it works, and others who say it doesn’t. If you base it on science, it’s hard to say. Just because it worked for 16 people doesn’t mean it will work for everyone. You need multiple studies with larger groups of people to produce the same or similar results before you can really call it proven. The company’s study was randomized, cross-over, double-blind. Men and women between 18 and 70 were included. Subjects participated in two testing sessions, one week apart. Blood samples were drawn over two hours after consuming either Growth Factor-9 capsules or a placebo. At the end of the study, the blood samples were tested for serum HGH levels, and independently analyzed. GF-9 lead to a 682% increase in serum HGH levels after two hours. This was significantly more than what was found in the placebo sample. Results vary depending on what else you’re doing while taking the supplement. If you’re not working out regularly, you certainly won’t see any benefit. You don’t really need to worry about taste in the capsule form. If you choose the drink mix, you’ll get a tropical fruit punch like flavor. But, I didn’t like it – mostly because the artificial sweeteners are so easy to taste. I didn’t experience side effects during my trial. I wasn’t able to find mention of side effects in all the reviews I read. But, that doesn’t mean it’s not possible to experience them. Some of the ingredients may cause side effects in certain people, so they are worth mentioning. Glutamine is considered safe when taken at no more than 40 grams per day orally. Glutamine’s effectiveness isn’t medically proven. L-Lysine is safe for most people, but may lead to stomach cramps and diarrhea in some people. L-Arginine is generally considered safe when taken for a short period of time. Side effects include stomach pain, bloating, and diarrhea. N-Acetyl Cysteine may lead to constipation, nausea, vomiting, or diarrhea. Schizonpeta is safe for most people in low doses. High doses, however, may lead to liver damage. If you have liver disease, you should avoid this supplement all together. At this time, there doesn’t appear to be any lawsuits involving GF-9 or Novex Biotech. The company has an A+ rating with the BBB, which is a good thing. “I have taken it daily for two weeks and do not see or feel any changes..” – Donald A. “GF 9 is the same thing as Seravital. GF 9 is for men? Exact same ingredients… just vitamins. Growth Factor-9 would work best with any diet, except vegetarian and vegan because of the gelatin present in the capsule. If you want to use it on those diets, you could use the drink mix. The product label for the Growth Factor-9 drink mix. If you opt for the drink mix instead of the capsule, it contains sucralose, which is an artificial sweetener. If you’re on an artificial sweeteners free diet, you’ll need to take the capsule. Honestly, I don’t see anything special about this formula. To me, it’s just an expensive set of amino acids you can get from a health food store for a lot cheaper. It’s another version of SeroVital. What’s the point? Even still, I know some of you will want to try it to see for yourself what it does. And, I really can’t say I blame you. There are a lot of promo codes available, like this one for 25 percent off, so you can at least save a bit of money if you decide to try it. 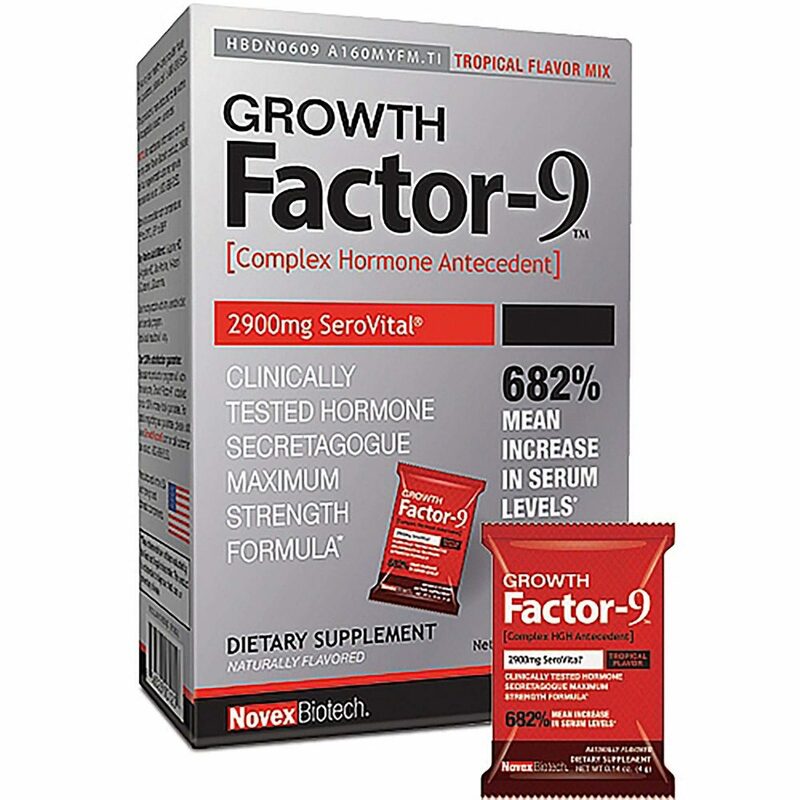 Growth Factor-9 can be purchased through Amazon or using their Official Site.